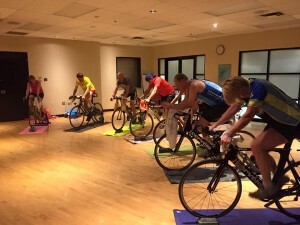 Club sponsored spin sessions are on again starting in January at “THE WAREHOUSE”. If you want, you can also leave your trainer on site so no need to transport it back and forth. We have access to a shower and kitchen. Full size 22″ fans will be setup along with music and video. Just bring your bike, trainer, towel, mat and water. Wednesday Night – Sonya Vanderwel who instructed us this last Fall session and one of the best – awesome. Saturday Mornings – Possibly spin to videos or a structured spin session. Still to be confirmed. Wednesday: January 13th. Ample parking right outside and ground level. Saturday: January 16th at 8:30 for the first session and we can decide from there what time suits us. Wednesday: 6:30 pm. Times to be conformed at first session to see what suits us all. Saturdays: 8:30 for the first session and we can decide from there what time suits us. Cost: Sweat and tears. No location costs as Scott Paragon is donating the location. trainer – If you choose to leave it on site, it will be stored for you in the warehouse. Looking forward to seeing you all there in January to ramp up your training for the upcoming race season.